You know what’s annoying? Finding a form online that isn’t fillable. You know what’s even more annoying? Having a form with additional pages that require re-entering the same information from the first page multiple times! Well, the Miami-Dade Clerk of Courts has just such a form for a civil court summons. While its eSummons for a business IS fillable, the eSummons for an individual is NOT, plus it requires duplicating the information four times, once for each language recognized in the county (English, Spanish, French, and Creole). Talk about inefficient! Perhaps the most bizzare thing is that someone in the clerk’s office invested the time preparing an entirely separate document, a set of instructions for how to make the form fillable yourself–rather than it just making it fillable like it did with the business summons. Why? WHY??? To add insult to injury, the suggested “Fill and Sign” functionality of Acrobat Reader won’t create the automation needed to simultaneously re-enter the information on the other pages of the form. And you know what’s sad? It only took me about ten minutes to make this form. I bet the staff in the clerk’s office spent more time creating the instructions for how to make the form fillable than just making the darn thing fillable. I just don’t understand why it couldn’t have created a useful document the first time. Oh well. 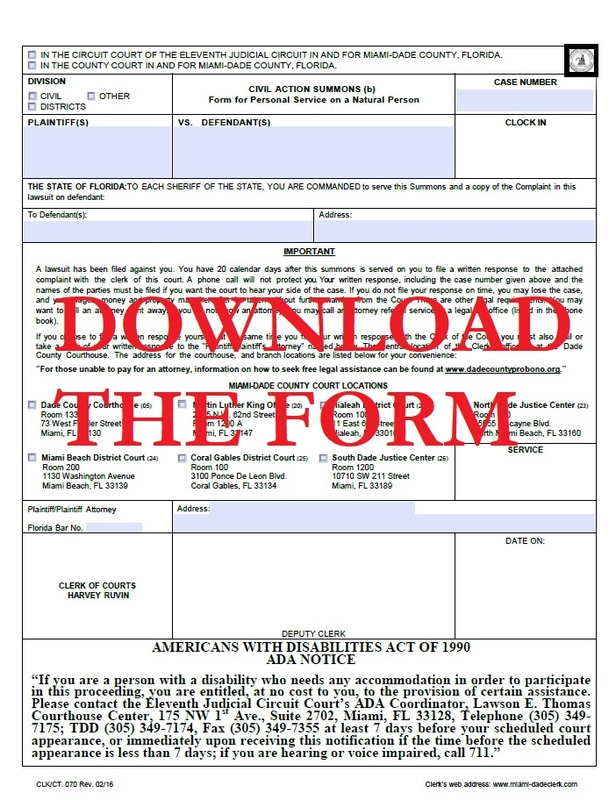 Anyway, as part of my work to help the public, and members of the bar and their staff modernize the practice of law, I’ve created a FILLABLE version of the Miami-Dade clerk of courts eSummons form for individuals. Not only is it fillable, but it also automatically populates the information entered on the first page onto the other three pages. Boom! You’re welcome. Click the thumbnail image below to download it, or click here.